Mercom Capital Group, llc, a global communications and consulting firm, has released its report on funding and mergers and acquisitions (M&A) activity in the Healthcare Information Technology (IT) sector for the third quarter of 2013. Venture capital (VC) funding in the sector continued to rise in yet another record quarter with $737 million raised in 151 deals. The dollar amount of disclosed deals surpassed the second quarter total of $623 million. Year to date, the Healthcare IT sector has raised a disclosed $1.85 billion. 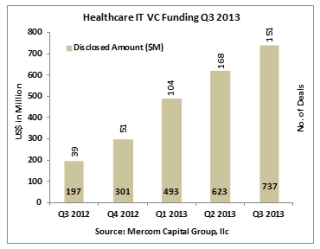 Chart - Healthcare IT VC Funding Q3 2013. While the 2009 HITECH Act helped launch the sector through its $17 billion allocation towards the adoption of meaningful use of healthcare IT, private investments into the sector have continued to rise with increasing EHR adoption. Release of healthcare data by the U.S. Department of Health and Human Services has also contributed to the growth of healthcare products and applications focused on consumers. Healthcare practice-focused technology companies received $489 million in 59 deals with population health, EHR/EMR, practice management, and data analytics companies all receiving attention this quarter. Consumer-focused companies received $248 million in 92 deals, with most funding ($161 million) going to the mobile health category, with mobile health apps and sensors receiving the most funding this quarter. The top VC funding deal in Q3 2013 went to Evolent Health, a population health management organization that integrates technology, tools and services to support value-based care and payment models, which raised $100 million from The Advisory Board Company, UPMC Health Plan and TPG Growth. Other top deals in the quarter included Practice Fusion, a free web-based EMR provider, which raised $70 million from Kleiner Perkins Caufield & Byers, OrbiMed Advisors, Deerfield Management Company, Industry Ventures, Artis Ventures, Morgenthaler Ventures, Felicis Ventures, Glynn Capital Management, Band of Angels Acorn Fund, H Barton Co-Invest Fund, and Goldcrest Investments; MedSynergies, a provider of revenue and performance management solutions for healthcare providers, raised $65 million from undisclosed investors; Fitbit, a fitness and health tracker company, raised $43 million in private equity financing from Qualcomm Ventures, SAP Ventures, SoftBank Capital, Foundry Group and True Ventures; and Oscar, a technology-based health insurance and telemedicine provider, raised $40 million from Thrive, Founders Fund, General Catalyst, and Khosla Ventures. There were a total of 168 investors in Q3 2013, including VCs, accelerators, incubators and crowdfunding platforms, compared to 161 investors in Q2 2013. Six investors participated in multiple funding rounds compared to 11 in Q2 2013. Kleiner Perkins Caufield & Byers and The Social+Capital Partnership were the most active investors and participated in four deals each. The remaining top investors participated in three deals apiece. They included FirstMark Capital, Founders Fund, HLM Venture Partners and Khosla Ventures. Mergers and acquisitions (M&A) in Healthcare IT totaled $1.1 billion in 45 transactions. Last quarter saw $108 million in 30 transactions. Health Information Management companies attracted the most acquirers in Q3 2013 with 22 transactions followed by Revenue Cycle Management with nine acquisitions and Telehealth with four. Healthcare IT disclsoed M&A transactions Q3 2013. There were only six disclosed M&A transactions in the third quarter, including the $644 million merger of Greenway Medical Technologies, a provider of an EHR, practice management and interoperability solution platform, and Vitera Healthcare Solutions, an EHR and practice management software provider; the $200 million acquisition of Medical Management Professionals, a medical billing and practice management company (subsidiary CBIZ), by Zotec Partners; and the $200 million acquisition of Cardiocom, a developer and provider of integrated telehealth and remote patient-monitoring services, by Medtronic. The Advisory Board Company acquired Medical Referral Source, a web-based software program that streamlines patient referrals from primary-care doctors to specialists, for $11.5 million; and IMS Health acquired Diversinet, a provider of secure, patented mobile technologies and connected health solutions for healthcare organizations and partners, for $3.5 million. Also in Q3, Mastech Holdings’ Healthcare Unit was acquired by Accountable Healthcare Staffing for $1.15 million. There were a total of 412 companies and investors mentioned in this report.